The Trunk Show is coming up really soon. What’s a Trunk Show? Well, it’s the new name for our Annual Holiday Homegoods Sale – a little better of a name, I think. Thanks to our new Trunk Show member Jana for suggesting it!! Jana is our knitter! We will be having knitted lovelies for sale this year! I’m totally excited. I really need a new poncho/scarfie thing for myself. The dates this year are December 8 and 9 from 2:30 until 6 pm. The location is the same – Cate’s House – PM me for more info if you want to come. And since the show is coming so, so, so fast I’ve been designing and sewing as much as I can. I’m going to have a lot of handbags and some new and improved designs. 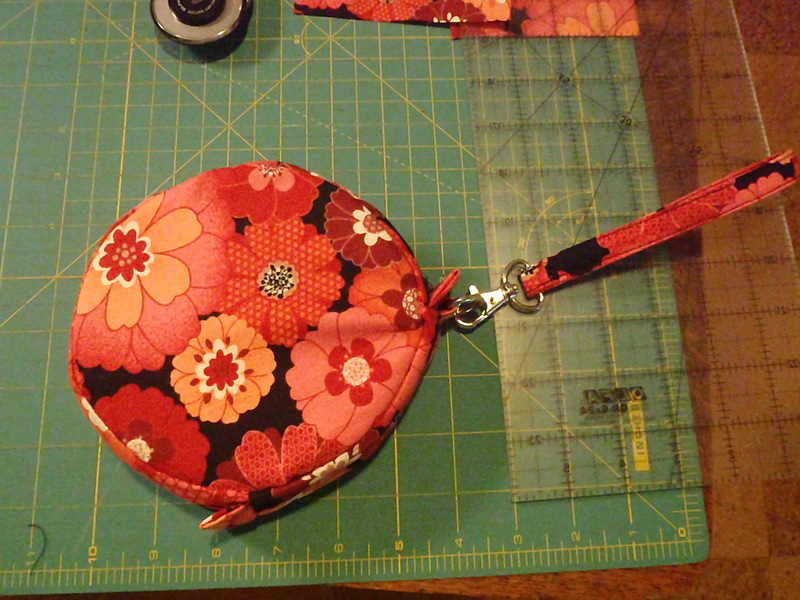 One is this awesome round wristlet that I just finished. 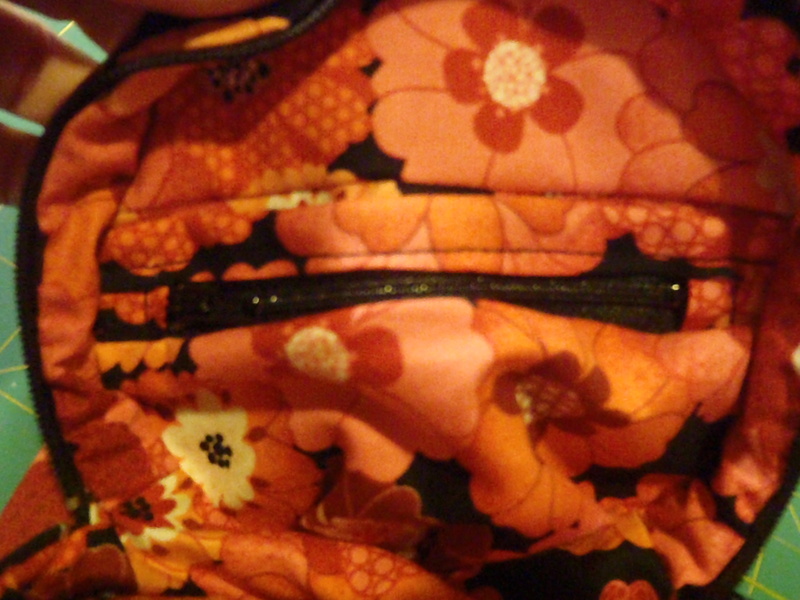 Flowery round wristlet – tentatively called the Sophie. I love it. I wanted something that was fun and flip with some whimsy. Something a pre-teen, teenager, 20-something, and up would want to run around town with. I think I’m going to make some that are smaller and more coin purse-ish without all the detail on the inside. Credit card pockets on one side. 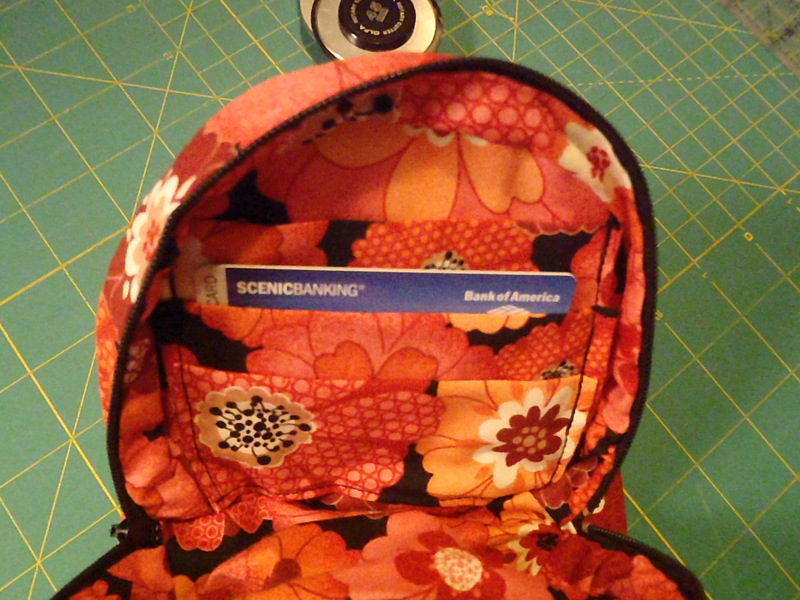 Zippered coin pouch on the other side. I’m also finding a need inside me to make some bigger bags. I’m finding inspiration from what I’m doing and what I need to haul with me on a day-to-day basis. Frankly, the purse I bought a Target a few years ago isn’t cutting it when I’m out and about and there is something distinctly unstylish about using those plastic reusable grocery bags you buy at Safeway or Giant. So what’s a hip momma to do? A first attempt at hipness. I found this amazing black and silver hounds-tooth fabric at G Street. The handles are a set of ready made vinyl handles that I picked up at JoAnn’s Fabrics. To me hounds-tooth has a quintessential aura of hip elegance. 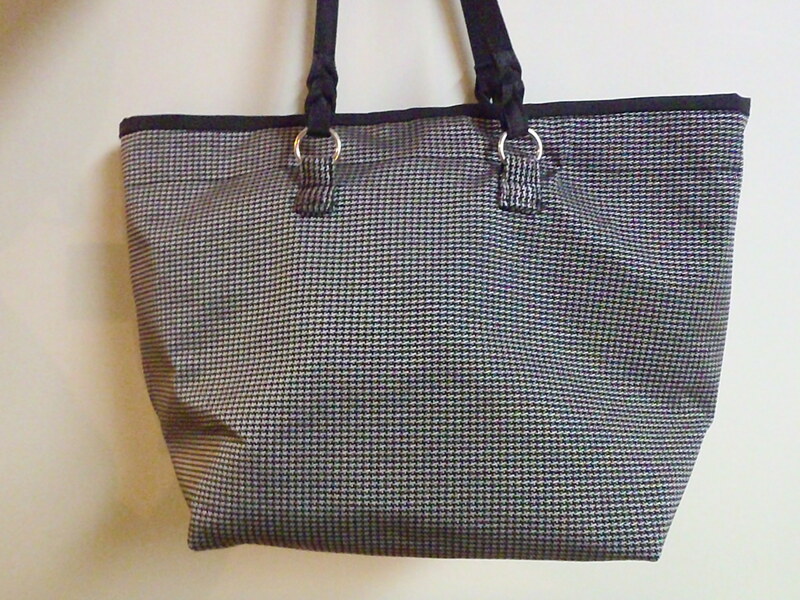 You can take this bag with you right into a meeting, out on a date, or throw some groceries into it when you have to make a quick run for necessities after work. Look how roomy she is! 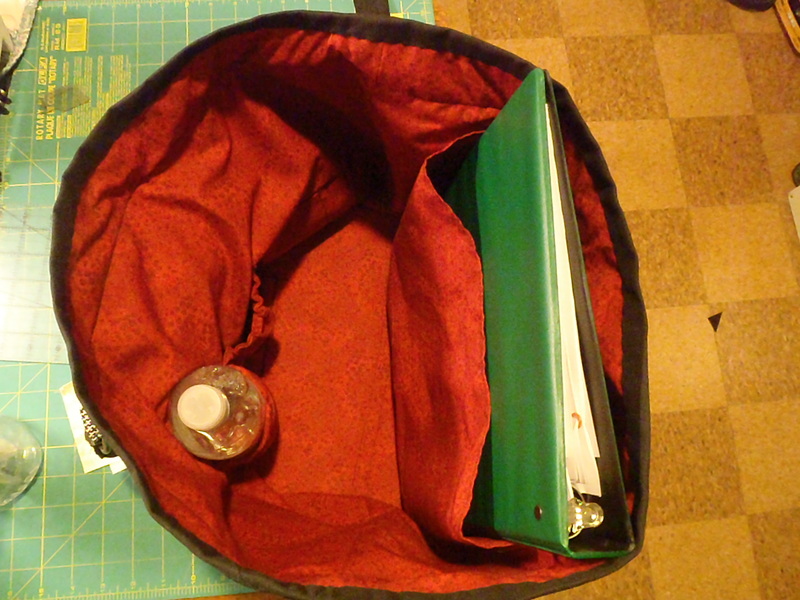 There’s a binder in there and two pockets for bottled water. There’s even a small pocket for holding pencils and pens. I’m thinking of calling this one the Chorister since I was thinking of all the things I need when I’m running from dropping my youngest off at school, into and out of work, to choir, out for a bite with my friends, to the library, back to school, and to the park with the kids and then to a PTA meeting. I’m working on more and more bags. I even have some quilts in the offing, but a lot of my focus right now is on bags. I’m simply obsessed with bags. Maybe after the show I’ll have time to make a new one for myself. Maybe.